WORDS & PICTURES by Kerry Fraser & Michael Barton. So there we were, in the middle of the Central Kalahari Game Reserve during the peak summer season. 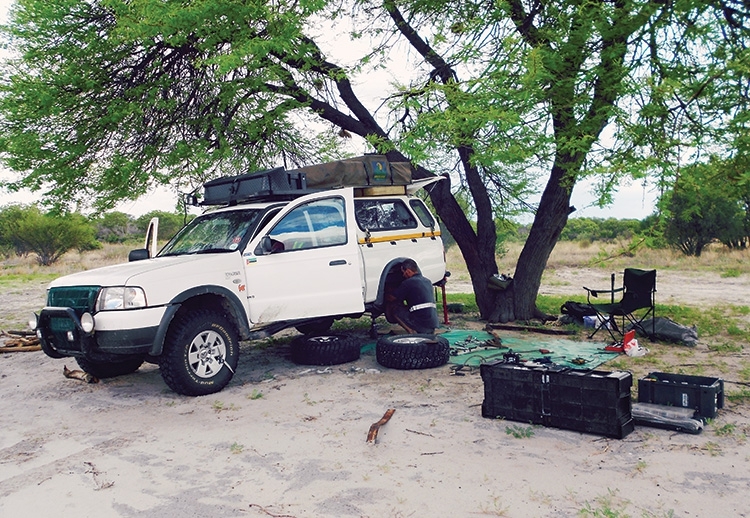 We were on a solo trip: 11 nights of self-sufficiency in this harsh, arid environment of sand, sun and sticky flies. The solitude and peace of the morning was shattered by a loud and ominous groan from our Ford Ranger. We lurched to a halt, optimistically hoping that it was just a puncture, and went to investigate. Our hearts sank as we saw the BFGoodrich tyre pressed up against the back of our Ford’s wheel arch – it looked like a broken spring blade. Michael got to work with the unpacking of our camper and finding some tools, while I got on the sat-phone and called everyone I could think of who might have a spare Ranger spring to offer. But without any luck. 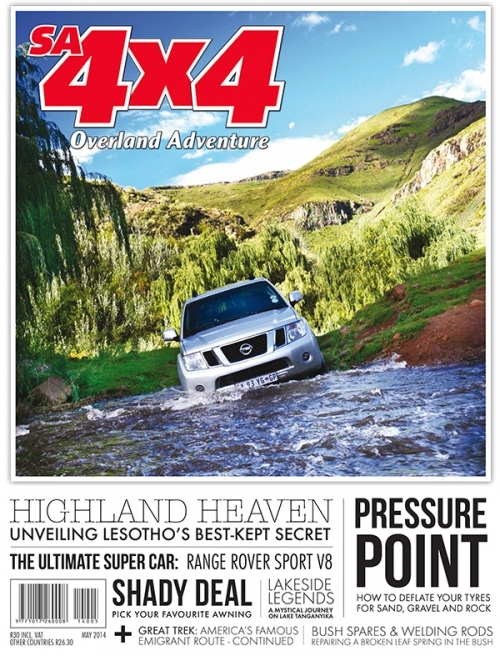 By now it looked like our bakkie had exploded all over the Kalahari, with bags and boxes strewn about. To make matters worse, a monumental thunderstorm was threatening to unload itself on our heads. Once we’d got the wheel off, the extent of our problem became painfully apparent: the blade had snapped cleanly in two. 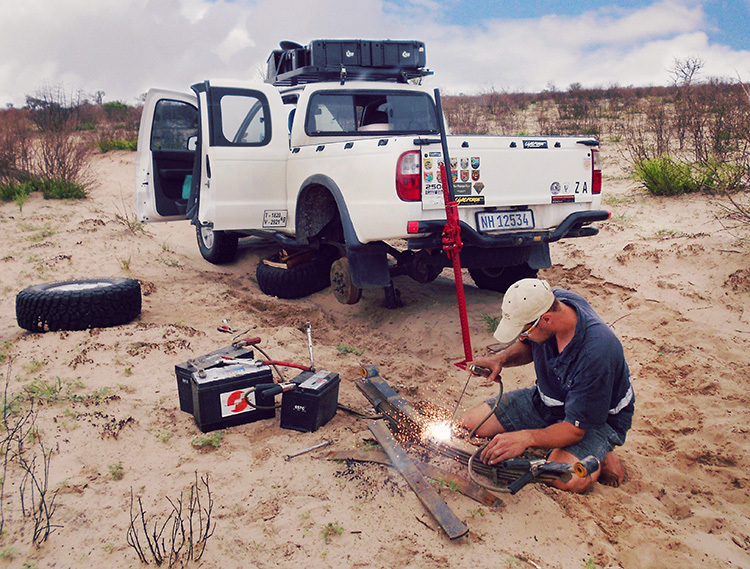 The repair job was going to be a challenge, but at least it gave us a chance to test a skill we’d learnt in SA4x4: welding with a series of 12 V batteries. Luckily, Michael had packed 15 multi-purpose welding rods for such an occasion, and, in the midst of our luggage, he got to work. First, he removed the spring pack from the Ranger’s axle. This was done to protect the vehicle’s electrical system from a possible overload while welding. He then connected our two deep-cycle batteries, as well as the vehicle’s cranking battery, by using vice-grips and spanners as conductors. Then, using the negative jumper cable as the earth clamp and the positive jumper cable to hold the electrode, he attempted to weld. As it turned out, the 36 V we had in series proved too much for a clean weld, so we removed one of the batteries to reduce the output voltage to 24 V. The results were surprisingly good. Four hours later, Michael had welded the break and reassembled the spring pack, the luggage explosion had been cleaned up and repacked, and we were back on the road. We limped at a snail’s pace of 15km/h, but, at least, we were moving. Hopefully someone would be able to meet us at Xade Gate the next day with a replacement spring blade. However, a few kilometres down the track, there was another loud groan and another soul-destroying lurch to a stop. The weld had broken. This time, Michael strapped the axle to the front eye of the spring blade using a towrope and a ratchet strap. He then carved a piece of wood to fit between the rear bumper and the rear shackle hangar, to prevent the shackle hangar from moving against the chassis and the wheel from jamming against the wheel arch. We set off again, even more slowly than before. We carried on like this for hours, pushing through after dark and making our way to Xaka campsite. Once we were through the Molapo Bushman settlement, we stopped to phone home, hoping that, somehow, someone would be able to offer us a solution. But we had no such luck. Meantime, a lion roared nearby, adding to our desolate sense of aloneness and isolation. We’d been on the road for 15 hours before we finally arrived at Xaka camp, exhausted and sunburnt, and feeling rather discouraged about the chances of the rest of our journey being unhampered by our vehicle’s injury.